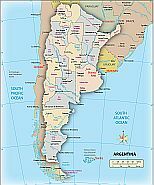 Editable royalty-free map of Argentina in vector-graphic online store. bordered by Bolivia and Paraguay on the north; Brazil, Uruguay, and the South Atlantic Ocean on the east; and Chile on the south and west. The region of Patagonia takes it name from the word pantagon, “big feet.” This name referred to the Tehuelche Indians who first entered the fertile plains wearing oversized boots. Argentina is the eighth largest country in the world. The terrain varies dramatically across the country’s different regions, as both altitude and latitude play a major role in Argentina’s geography. The country’s four major physiographic provinces are the Andean region, the lowland North, the central Pampas, and Patagonia. Patagonia includes Tierra del Fuego, the southernmost point of the South American continent, shared by Argentina and Chile. The Atlantic Ocean comprises Argentina’s eastern border. 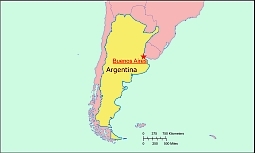 Argentina has one of the largest ports on the Atlantic Ocean in Buenos Aires. The area of the South Atlantic around the Valdés Peninsula is home to one of the world’s largest concentrations of the Atlantic Right Whale (Eubalaena glacialis). The Argentine coast is also known for being home to the Magellanic Penguins. 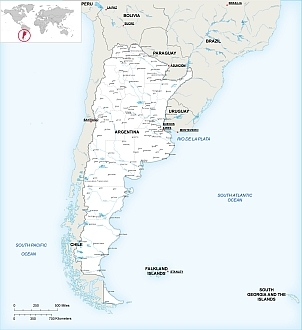 Argentina shares the offshore island territory of Tierra del Fuego with Chile, and also owns Isla de los Estados, separated from Tierra del Fuego by the Strait of Le Maire. Argentina claims the Falkland Islands (Islas Malvinas), a large archipelago to the southeast of the country that is under the control of the United Kingdom. Argentina’s climate ranges from subtropical in thenorth to humid in the central regions, to subantarctic in the south. The average temperatures for the summer months—January, February, and March—are highs of 75° to 95°F (24° to 35°C) and lows of 60° to 75°F (16° to 24°C), with January being the warmest month. The winter months, May through August, are the driest period of the year, and the coldest months are June and July. The average winter temperatures are highs of 58° to 65°F (15° to 8°C) and lows of 47° to 53°F (8° to 12°C). Climate variations are due the country’s range in altitude as well as latitude.